An attractive hotel, with numerous activities on offer. Dine at the restaurants, lounge by the pools or venture into town for a bit of evening entertainment. A great complex with something for everyone. The hotel is about a five minute walk from the sea front at the top of a hill. We found in the two rooms which we had that all the beds were camp beds and has hard as iron to sleep on. All rooms have a safe at fifteen euro per week and TV at fifteen euro per week but you will only get BBC world or sky news in English. Heating or air conditioning is also fifteen euro per week to hire, and the bath rooms are very small. There are four hotels in the complex, one of which is also a disco at night time, if that’s what you call it, all we found was someone playing c/d`s all night and kids running about. The main hotel is where, if you are a blue band, you have to go for your meals the food itself is not bad but you cannot get any alcoholic drinks in the restaurant. All drinks come in plastic cups, be it alcoholic or tea and coffee and the coffee tastes horrible, as it comes from a machine. The site itself is nice and clean and well looked after. I was worried about going to this hotel because of the other reviews, I stayed in the Nubia one of the blocks outside the main complex it was only 2 minutes away, it’s only a 1 star but I found it spotless a maid service every day the bathroom was extremely clean couldn't find a fault in how clean it was. The food was ok, loads for breakfast, during day you have a snack bar inside and bbq and pizza bar outside they were pretty good the evening meal was the ok as you can always get something to eat but not a great choice, but to be fair we ate so much during day that I didn't need a lot a night. The queues at the bar went down fast they are small glasses and only 2 per person at a time. We just looked at it that we paid £184 for both of us for 4 nights all inclusive I couldn't get bed and breakfast for that in England. Many people we met have been back many times so if it is as bad as people say why would these people go back each year, we will be returning and probably with the kids next time. Go on give it a try, it’s well worth the money. I would never ever stay in this hotel again; our rooms were a good walk away from the main part of the hotel which is not what I expected at all. The food was not up to the standard I expected, the maid kept our room clean, good job because we had the smallest bathroom I have ever seen in my life! Some of the staff were ok but I sensed a general couldn't be bothered attitude overall, the entertainment was poor in my opinion. I didn't think the location of this hotel was very good, our part of the hotel was situated on a very busy road that took ages to cross in the morning on the way to breakfast and definitely a problem if you had children with you, a bit like the m6! After reading mixed reviews on various sites about this hotel I decided to take a gamble on it, couldn't be as bad as some fussy people made our right! We arrived on the Saturday morning and like other reviewers were told that we had no room - we argued that we had booked the Palma Bay hotel in good faith and had thankfully confirmed where we would be staying with our holiday provider just the day before we left (who confirmed we were booked in to the 3* main complex) and showed the reception this. Answer: We have no room for you but we have booked you another hotel so it's not a problem. Cue another argument. We had no choice but to accept that we were being farmed out to another hotel (Olympia or something like that) at the other side of town, but they would pay for our taxi there (said as if this was to be a bonus). 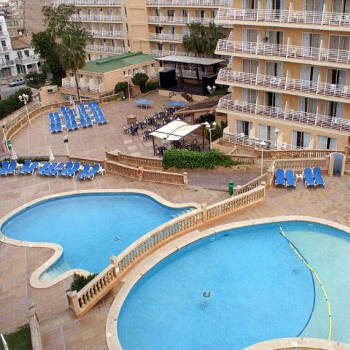 We were to return the next day at 13:30 where they would try and find us a room within the Palma Bay resort. At this point I could go in to the state of the Olimpia hotel and the maid and security guard appearing at our door to throw us out the room but I won't - this is a Palma Bay review. Anyway, we headed back at 13:30 to get our room - again another argument with reception (who by the way are very good at giving you the sympathetic look while knowing fine well they are turning you over). Success ! We were given a room in the Habana building (another brief argument when we were handed the map to discover it was outside the complex)but at least we were assured it was part of the 3* rating and after all it was only just across the road. We were given a rotting (wooden door frames etc.) room next to the lift on the 7th floor, the main room door from the corridor was so bad that when even gently closing it the whole door & frame moved in your hand - it looked as though one slight kick and the whole thing would fall out. Our 'air-conditioned, 3* room' we had booked was in fact a small hole with a ceiling fan that made a loud scraping noise when turned on. Again, back to reception for an argument, cue the sympathetic look and again told to come back the next day at 13:30. We stayed the night and honestly, my daughter and wife could not sleep due to the heat - the ceiling fans was useless and not a breath of air came in to the room when the balcony door was opened. What I will say about the Habana building is that if you want to eat in here make sure you get in the cue before the doors open, not enough tables to accommodate all the guests and food selection is very limited. We had a German family standing next to our table waiting for us to finish our food who then pounced as soon as we got up before anyone else could grab the table. OK, so day 3 and back to reception - we have no room for you, told them that my 4 year old could not sleep with the heat and that we had booked an air-conditioned room; no arguing with the guy - he informs us that we haven't and to take our complaint up with our holiday provider and not him (although, giving 'the look' he told me he 'understands our problem'). Remembering one of the other reviews, I ask him how much it would then cost to 'upgrade' to an air-conditioned room - hang on, his eyes widen and he says he will check, comes back to say that there are no rooms today; by this point I think I'm ready to jump over the counter but ask - OK so when will you have one available, I want to be first on the list for one. OK he says, we do have a room for you (amazing) but it will cost you ten euros per night extra and you will have to come back at 13:30 for the key. We go back to our oven and pack our bags again, the maid then walks into our room and tells us to get out as we are moving rooms and that she has to clean it for the next guest (it's only 10:30 at this point) - needless to say she was told where to go, politely. We go back to reception at 13:30, pay the man and get a receipt for our money and the key for our next room. 13:30 seems to be the time they want to check everyone in so even if you turn up earlier you are told to come back - be prepared for a long wait. As we were in reception for 3 days in a row for over an hour each time we witnessed countless families being told the same story we were over and over again and being farmed out to other hotels. So, onto hotel #3 - the Acapulco block just behind the main entertainment stage. What can I say - chalk-n-cheese, this is a 3* room and hotel. Room was clean (apart from a dubious looking stain on my bed sheet which wasn't changed in the remaining 4 days of our holiday). At meal times, the restaurant in the basement is far superior to the one in the Habana building with a far better selection of food available - maybe it was just a coincidence that all the other guests in this block were Spanish? Hotel facilities (pools etc. ): good for the kids. Kids Mini Disco: your right it's mini - 3 songs only each night then a hard sell to buy bingo tickets. Bar service: very bad, each block has it's own bar which never opens resulting in everyone having to go to the main bar at the entertainment stage. Expect to wait in line (unless you are German of course) for quite a while to get served your rationed supply of 2 plastic cups worth of gut-rot. Pool Bar (at the Copacabana): very good but only open until 18:00, if you go all inclusive to get drunk then this is really the only place you could mange to do so as it is no where near as busy as the other bar. Also the bar staff here are quite friendly. Location of hotel: Bad, although it's only a 10 minute walk to the beach you are not in the 'nice' part of town to go wandering - especially at night with a young family. Would I go back: no chance. Would I recommend it: no chance. Suitable for: smokers - everyone seemed to smoke - everywhere! we arrived at 11 am to be told that our room wasnt ready until 1-30 reception told everybody the same you would think that they know what time you are arriving so they would have some rooms ready. after been told to leave luggage in reception we headed for the bar and snack area what a dissapointment. the snacks consisted of a toastie machine the bar area was so packed it took you 10 minutes to get served then to be given your drinks in a plastic cup you no sooner got back to your table that you had to start the procdure again. we took our grandson who was 10 nothing for him to do good job he likes to swim as that was all for him to do. wee had a lovely time in the palma bay club,hotel was very clean as were the rooms in the nubia,it was unfortunate we had to cross the road to our complex .food was fantastic great barbecue and the fresh made pitzas at one of the pool bars was a hit with my son.wasnt many brits though.Daytime entertainment was probably better than the evening programme.though one evening a tribute band put on a fantastic performance.In a lovely location.staff were very helpfull at all times.I would definately go back. talk about holiday from hell, well this is the most utterly disgusting hotel i have ever stayed in, please im begging you dont go, especially if you are english because you will not be welcome as this is a very german resort. We've been to this hotel last year and the only thing I can say is: Never again! First we were put in the building across the street called the Havana. The first night was one from hell! The matresses felt like rocks, we could hardly move in our room, light switchers didn't work, and our balcony door was stuck and rotten. We heard our neighbours -3 boys - having loud *** (you know what) at 4am. It was as if they were in our room - Isolation was... well there wasn't any! You could easily follow a conversation between your neighbours without having to put your ear against the wall. The next day we asked to be put in the main building. First they said it wasn't possible but after some really good arguments (they seemed to know very well what we were talking about), they eventually gave us another room with a view over the main pool. We thought it was much better, apart from the emergency door next to ours that lead to a staircase outside the building. The door was rotten and couldn't be closed anymore! Aside from that and the cockroaches in the bathroom, we thought we were gonna be ok. Little did we know... We haven't slept one entire night during our whole stay because of drunk people coming back in the early morning, screaming and singing and awakening the whole hotel! How selfish can you be! Then, during our last night, we were asleep and we heard someone put a key in our door and opening it. There was someone right there in our room! Turned out there was a Bulgarian burglar gang in Mallorca that broke into rooms of people that were out partying! But luckily we were there! Those burglars pretend to be hotel guests that have lost their keys and at the reception they are given the spare key very easily. The people at the reception desk didn't seem to make a problem of it when we complained. It seemed totally normal to hand a spare key of a room to just about anyone who asked for it! I will NEVER EVER go to this hotel again! They should close the dump! arived0520in morning told no room but offered another hostel which others had refused due to infestation of cockroaches and filth sat in reception until offered room across road to complex at 14.00 following day no aircon ect no help from reception wanted to come home entertainment in all but English food bad had to eat out all mealtimes paid for 3 * stayed at 0* nubia with view of burnt out hotel worst experience of my life. Where do I start. The only good thing I can say about this hotel (if you can call it one) is it was clean. The staff were very ignorant and rude especially on the reception. On are arrival they just gave us a map to our accomodation which took ages to find as it wasn't even in the hotel complex. It was two streets away in a dirty back street in a block called Nubia. The room itself was nice and clean but like living in a hamster cage for 10 days no window or ventilation in bathroom which was as big as a toilet cubicle so after shower you couldn't see your hand in front of you for steam. As for the food it's the worst i've ever experienced in my life. It was cold stale and every day chicken drumsticks and pasta and chips it was so bad we spent half of our spending money eating out. The entertainment on an evening was diabolicle all i can describe it as is the staff messing about on the stage thinking they can dance act and sing. They did get outside entertainment in 3 times in the 10 days we were there but that was just as bad. When we arrived the air con didn't work we reported this to reception every day on more than one occasion it took four days for them to repair it. All the time we were there the T.V. never worked they kept saying they would send a technician out but still no sign when we left. The last four days we were there they dug the road up right outside our balcony. The drilling started at 8.o'clock in the morning the noise was herendous. Couldn't even hang anything on the balcony because it got covered in dust from the roadworks. On the night at dead on 12.o'clock security came round with truntions banging on the tables telling you to leave the area couldn't finish your drink or conversation you just had to get up and leave. It was like a consentration camp. We were there for four days and the bedding was only changed once and that was for the last night we were there which I thought was pointless for our last night unless they left it on for the next poor people who were staying there. This was a holiday from hell to top it all i was mugged by gypsies in Palma down by the harbour. Please take note of my review as I wouldn't want anyone to suffer as we all did.